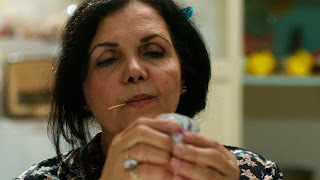 This 12-minute short, listed on Tribeca’s official site as coming from the “Occupied Palestinian Territories,” centers itself on a fortune teller who uses tea cups to predict the romantic destiny of the women who come to see her. As she consults with one visitor, a bride and her American cousin rush in, desperate for answers about whether the match is truly right. What “The Cup Bearer” represents is a complete immersion in one culture, best exemplified by the response of one guest to the American’s naïve question, “How do you say ‘privacy’ in Arabic?” The answer, of course, is, “In Arabic, we don’t have that word.” That humorous reference best captures the film and its universal nature, set on one specific story but easily applicable to any number of cultures and parts of the world. The acting is exaggerated but fun, much like this entertaining, often silly short. This short film is screening as part of the “Skin Deep” program. See it or skip it? It’s an amusing snapshot of the hopeful nature of fate and fortune, which is about as satisfying as it sounds.